What an Amazing week at Amazing Grace Food Pantry! Lots of volunteers to give lots of food! Saturday volunteers served 73 families. A total of 676 people received 14,000 pounds of nutritious food! Families really enjoyed the watermelon, cheese and other dairy products available along with canned goods and meats for the week. We’re excited to see so many young people thinking of others’ needs. First Baptist Wylie’s new local missions group, Second Saturday Outreach (SSO), helped sort and stock shelves. 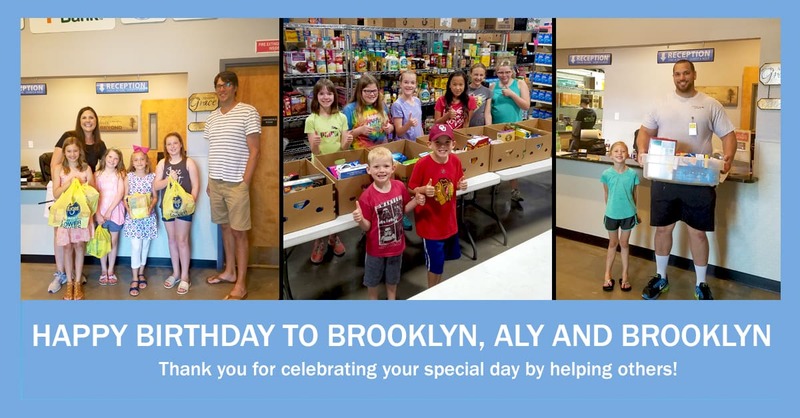 Brooklyn celebrated her 9th birthday with friends by volunteering at AGFP. They donated food, stocked shelves and prepared the pantry for the next client day. Aly celebrated her 11th birthday with friends by volunteering at AGFP and collecting $100 to donate towards food. They were busy stocking shelves and organizing. Five year old Brooklyn and her family have started collecting spare change to make a difference in someone’s life that is in need at Christmas. Brooklyn asked her mom “What if they need food now and can’t wait till Christmas?” Mom took her grocery shopping and Brooklyn helped to stock shelves with the food she donated. Thank you so much, kids! Email Updates: If you previous subscribed to receive pantry updates via email, please sign up again. We apologize for the inconvenience.